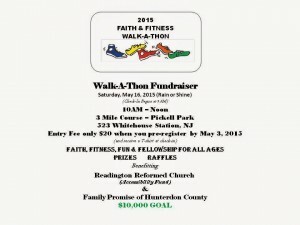 Readington Reformed Church Faith & Fitness Walk-a-Thon | Family Promise of Hunterdon County, Inc. Readington Reformed Church Faith & Fitness Walk-a-Thon – Family Promise of Hunterdon County, Inc. Proceeds will benefit Readington Reformed Church Accessibility Fund and Family Promise of Hunterdon County. Readington Reformed Church is an established church nestled in rural Readington Township in central/western New Jersey. Our congregation was founded in 1719 and is part of the Reformed Church in America. We are a congregation of believers with a long history of service in this community through missions, outreach, fellowship, and partnering with support groups and community organizations. Family Promise of Hunterdon County is the only homeless shelter for families in Hunterdon County. Family Promise and the Interfaith Hospitality Network (IHN) are a unique community partnership of paid staff and volunteers from a vast network of congregations throughout Hunterdon County. They offer a continuum of services that includes shelter, food, homeless prevention/rapid re-housing, mental health services and after-shelter support. Registration packets will be available on or about April 1,2015 If you have questions or need more information, please call Bob Lefever at 908-285-6320 or call the Readington Reformed Church office at 908-534-2077. To register online go to www.readingtonreformed.org and click on the Walk-a-thon link.